The past couple years we have seen a major change in the fashion industry; women are no longer going through the pain of wearing their favourite pair of heels to work, they now can wear comfy trainers and not be judged whatsoever. Thanks to the athleisure and luxe sportswear trend that has gone from strength to strength it's now more than acceptable to be wearing trainers at any time of the day - they're not just for working out anymore. But now it seems that one shoe in particular - Adidas Superstar - has become too popular that it's time is now up. We hate to say it but it may be time to look for a new shoe to wear. Why, you might be asking? Well, it's because, literally EVERYONE is wearing them. EVERYONE. From 14 year-old girls hanging around the high street to mum's doing the weekly shop. You cannot escape them. The Adidas Superstar has reached the peak stage on the fashion cycle - and we're not the only ones who have noticed. 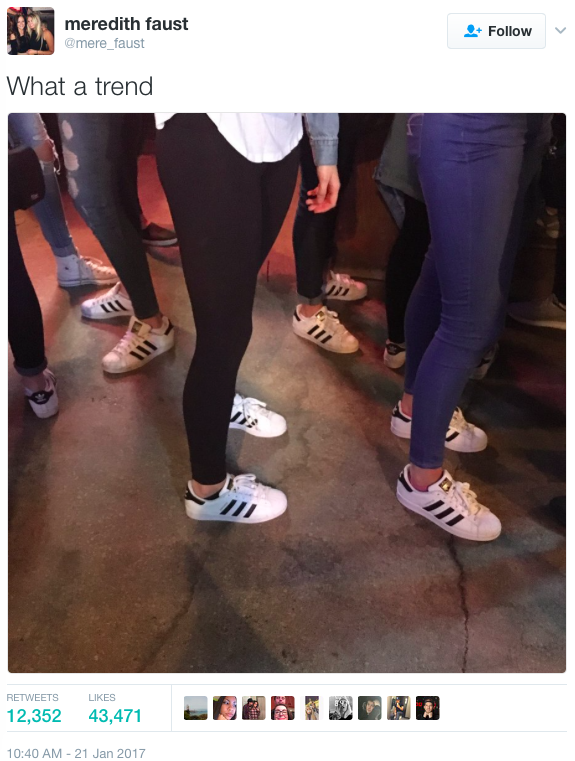 Twitter user, Meredith Faust, picked up on the popularity of the trainer, when she tweeted a picture of a group of girls who were all wearing the classic white and black striped shoe. And we're not talking about one or two girls, there's six! Now we're not telling you to completely abandon your go-to shoe, after all, they are the most amazing thing - both stylish and comfy. It's up to you - either keep them for when they come back around or keep rocking them like it's nobody's business. This happens time and time again, next it'll be the same for the ever-popular Vans, that are also everywhere at the moment. We won't be parting ways with our Superstars anytime soon, but we might not be wearing them as often as we would like. We still love you Superstars!